Francis Xavier or Frances de Jasso (Castle of Xavier, Kingdom of Navarre, 7 April 1506 – Island of Shangchuan, China, 3 December 1552) was a priest and missionary from Navarre, one of the precursors of the Society of Jesus and a close associate of its founder, Ignatius of Loyola. 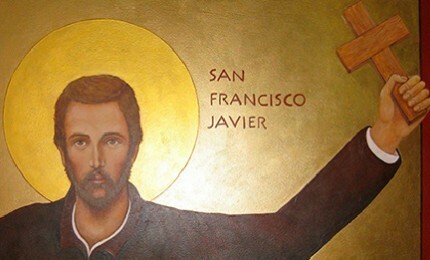 He was canonized by the Catholic Church under the name of Saint Francis Xavier. He stood out for his missions in India and East Asia. He was known as the Apostle of the Indies. After carrying out reordenation and supervision tasks in the missions in India and the Moluccas, where he felt disappointed at the deterioration undergone, as shown in his letters, he set out for Japan, together with Cosme de Torres and Juan Fernandez and the translator Anjirō on Palm Sunday 1549, arriving in Japan on 15 August. They disembarked in Kagoshima, which was then the capital city of the Southern Kingdom of Japan. He stayed in that city for a year and in Japan for two years and three months. In collaboration with Pablo de Santa Fe he evangelized in Japan and had the work Declaration of the Articles of Faith translated. He learnt it by heart and used to recite it on street corners. To respond to the questions of the passers-by, he used an interpreter. In view of his lack of success, he decided to meet the king of the area in the hope that if he converted to Catholicism, his people would do so too. In 1550 he headed north with this aim. He founded a small Christian group in Hirado. In the 16th Century, Francis Xavier became a role model as a missionary on pagan land. This has given rise to a prolific production about his figure and to works of all kinds, especially epistolary, as he has been considered an example to be followed by the members of the Society of Jesus.